The supratip area is defined as consisting of the distal portions of the upper lateral cartilage, the dorsal septum, anterior septal angle, and the parallel cephalic border of the lateral crura of the lower lateral cartilage. See the image below. Aupratip and tip-defining point (cross). Supratip deformity is defined as fullness or convexity located immediately cephalad to the nasal tip and may occur as both a primary and secondary deformity. As previously mentioned, supratip prominence may occur de novo or as the result of technical misadventures and inadequate surgical planning. In this case, supratip prominence is persistent and is in contrast to the normal transient swelling commonly noted within the immediate postoperative period. Instead of prominence, an aesthetically pleasing nose demonstrates a supratip breakpoint at the point cephalad to the nasal tip where the contour lines of the nasal dorsum rise toward the tip-defining points. Clinically, this break defines a nose in which tip projection slightly exceeds the profile line of the dorsum. Anatomically, the supratip break is a consequence of the projection differential between the domes of the lower lateral cartilages and the dorsal septal plane. For this to occur, the dome-defining points must be at least 6-7 mm above the plane of the anterior dorsal septum in thin-skinned individuals and 10 mm in those with thicker skin. In patients with a supratip deformity, this breakpoint is lost, the supratip assumes a misshapen convex profile, and the aesthetic ideal is not attained. Although numerous authors have described appropriate overall rates of revision rhinoplasty ranging from 5-12%, [9, 10, 11] the true revision rate is arguably much higher (Baker, personal communication). While several algorithms have been proposed for diagnosing and describing rhinoplasty deformities, the most straightforward is that of Stucker. In his 1984 review of 406 secondary rhinoplasties, he stated that the most common deformity was "...an uncorrected defect or pre-existing problem compounded by surgical insult." Stucker divided deformities anatomically into those involving the upper, middle, and lower third of the nose. Deformities of the tip, or lower third, most commonly were associated with bossae (knuckling of the lower lateral cartilages) and a hanging columella. In the middle third, polly beak deformity and pinching of the supratip were most common. Finally, in the upper third, excessive dorsal reduction and dorsal irregularities were the most common reasons for secondary surgery. Inadequate tip support both may bring about and accentuate the supratip deformity. In reference to structural considerations, Anderson described the tip as a tripod constructed of two long legs of the lateral crura adjoined to the short leg of the conjoined mesial crura. When this support is lost, the lobule will "...tilt downward as much as the length of the mesial crura, the shortest leg of the tripod, will permit." When technical adjustments compromise the essential tip support framework, tip projection and rotation may be compromised, unveiling the anterior septal angle and supratip dorsum. Whether in concert with overresection or underresection of the dorsal septum or as an isolated event, the result is the supratip deformity. In 1975, Sheen presented clinical results of 100 consecutive secondary rhinoplasties for supratip deformities of which 80% were corrected by dorsal augmentation with or without tip grafting. In evaluating the deformity, he applied direct pressure to the supratip, pressing it down to the underlying anterior septum. He proposed that by doing this, he could assess underlying local support of the supratip (or lack thereof) and identify the need for dorsal augmentation or local resection. However, in his experience, he noted that in most supratip deformities, underlying support was lacking and commented that "...augmentation, not reduction, was the answer..." to supratip fullness. He added, "Besides the diagnosis and treatment of supratip deformity, the other aspect of this milestone is prevention. Understanding that the size of the skeletal framework must be proportionate to the size (and character) of the overlying soft tissue, the surgeon can prevent supratip deformity by retaining adequate dorsal support." A careful review of Sheen's treatment of the supratip deformity reveals that in most cases, he favored not only dorsal augmentation but emphasized the need for concurrent support of the nasal tip. He commented that the patient with a long skin sleeve was predisposed to the supratip deformity in which the nasal base appeared to fall off the anterior septal angle, producing elevated supratip positioning relative to a drooping nasal tip (Sheen, 1998). Secondly, he identified the inevitable development of scar tissue and proposed focusing on reducing its contribution to postoperative tension of the middle and lower nasal third by (1) lengthening the mesial crural leg of the tripod to prevent it from tilting downward by inserting a cartilaginous strut between the mesial crura and thus preventing downward tilting, which could be caused by subsequent scar formation, and (2) by suggesting division of the lateral crura vertically just past mid alae when tension from recoil of these structures was anticipated, stating that along with cephalic trimming, this allows for less resistance to tip rotation. Finally, he recommended maximal apposition and draping of the soft tissue overlaying the nasal skeleton. To achieve this, he suggested (1) undermining the soft tissue to the pyriform margins in all directions, taking care to avoid overresection, (2) lowering the cartilaginous septal dorsum until the superior septal angle is level with the nostril apices, (3) trimming soft tissue, as necessary, from the undersurface of the skin, and (4) as a last resort, carefully crosshatching the dermal undersurface. Although these latter two steps formerly were recommended, they now are considered of historical interest, having since fallen into disfavor, and generally are not recommended by most practicing plastic surgeons. More recently, Guyuron, in his 1999 review, addressed the supratip deformity and recommended avoiding overzealous resection. In addition, he proposed eliminating supratip dead space by directly suturing and coapting the skin envelope to the underlying cartilaginous framework, stating that direct contact between the cartilage and the subcutaneous element of the skin seemed to be the key factor in supratip deformity. Transcutaneous suture apposition of the supratip, while attractive as a preventative measure, has not gained widespread acceptance and largely has been supplanted by the use of compressive dressings and nasal splinting in the early postoperative period. Supratip deformity, previously defined as the polly beak or parrot beak deformity, is defined as a fullness or convexity located immediately cephalad to the nasal tip and may occur as both a primary and secondary deformity. In addition, the patient commonly is noted to have a low dorsum, blunted tip lobule, and a wide nasolabial angle (Sheen, 1998). When it occurs as a secondary event, it is generally the result of technical misgivings and inadequate surgical planning and is persistent, in contrast to the normal transient swelling commonly noted within the immediate postoperative period. Converse JM. Corrective rhinoplasty. Converse JM, ed. Reconstructive Plastic Surgery. 2nd ed. Philadelphia: WB Saunders Co; 1977. 1152. Hussein WK, Foda HM. Pollybeak Deformity in Middle Eastern Rhinoplasty: Prevention and Treatment. Facial Plast Surg. 2016 Aug. 32 (4):398-401. [Medline]. Sheen JH. A new look at supratip deformity. Ann Plast Surg. 1979 Dec. 3(6):498-504. [Medline]. Sheen JH. Secondary rhinoplasty. Sheen JH, ed. Aesthetic Rhinoplasty. St. Louis, Mo: Mosby; 1978. 464. Guyuron B, DeLuca L, Lash R. Supratip deformity: a closer look. Plast Reconstr Surg. 2000 Mar. 105(3):1140-51; discussion 1152-3. [Medline]. Labrakis G. The universal nose of early childhood: nature's aid in understanding the supratip deformity and its correction. Ann Plast Surg. 1992 Jul. 29(1):55-7. [Medline]. Byrd HS. The supratip break. Presented at: The Dallas Rhinoplasty Symposium. Dallas, TX: 1996. McKinney P, Cook JQ. A critical evaluation of 200 rhinoplasties. Ann Plast Surg. 1981 Nov. 7(5):357-61. [Medline]. Swanepoel PF, Eisenberg I. Current concepts in cosmetic rhinoplasty. S Afr Med J. 1981 Oct 3. 60(14):536-44. [Medline]. Stucker FJ, Bryarly RC, Shockley WW. The failed rhinoplasty. Gates GA, ed. Current Therapy in Otolaryngology - Head and Neck Surgery. Philadelphia, Pa: BC Decker; 1984. 129. Stucker FJ. 120 cases of revision rhinoplasty. Sisson GA, ed. Plastic and Reconstructive Surgery of the Face and Neck: Proceedings of the Second International Symposium. New York, NY: Grune & Stratton; 1975. 29. O'Connor GB, McGregor MW. Secondary rhinoplasties: their cause and prevention. Plast reconstr surg (1946). 1955 May. 15(5):404-10. [Medline]. Rees TD, Krupp S, Wood-Smith D. Secondary rhinoplasty. Plast Reconstr Surg. 1970 Oct. 46(4):332-40. [Medline]. Johnson C, Toriumi DM. Open Structure Rhinoplasty. Philadelphia: WB Saunders Co; 1990. Anderson JR. Symposium: the supra-tip in rhinoplasty: a dilemma. III. 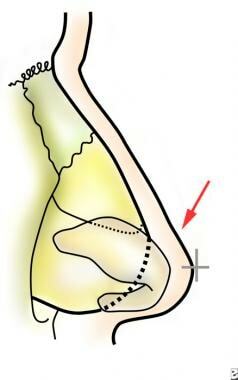 Supra-tip soft-tissue rounding after rhinoplasty: causes, prevention and treatment. Laryngoscope. 1976 Jan. 86(1):53-7. [Medline]. Deneke HJ, Meyer R. Corrective and Reconstructive Rhinoplasty. NY: Springer-Verlag; 1967. 451. Gruber RP. Primary open rhinoplasty. Gruber RP, Peck GC, eds. Rhinoplasty, State of the Art. St Louis: Mosby; 1993. 85. Ozucer B, Yildirim YS, Veyseller B, et al. Effect of Postrhinoplasty Taping on Postoperative Edema and Nasal Draping: A Randomized Clinical Trial. JAMA Facial Plast Surg. 2016 May 1. 18 (3):157-63. [Medline]. [Full Text]. Gunter J. External approach for secondary rhinoplasty. Dallas, TX: Presented at: Dallas Rhinoplasty Symposium; 1999. 291-304. Momeni A, Gruber RP. Primary Open Rhinoplasty. Aesthet Surg J. 2016 Oct. 36 (9):983-92. [Medline]. [Full Text]. Aufricht G. Rhinoplasty and the face. Plast Reconstr Surg. 1969 Mar. 43(3):219-30. [Medline]. Burgess LP, Everton DM, Quilligan JJ, et al. Complications of the external (combination) rhinoplasty approach. Arch Otolaryngol Head Neck Surg. 1986 Oct. 112(10):1064-8. [Medline]. Cohen S. Complications following rhinoplasty. Plast reconstr surg (1946). 1956 Sep. 18(3):213-26. [Medline]. Farrior EH. Dramatic refinement of the nasal tip. Otolaryngol Clin North Am. 1999 Aug. 32(4):621-36. [Medline]. Funcik T, Hochman M. The effect of intradermal corticosteroids on skin flap edema. Arch Otolaryngol Head Neck Surg. 1995 Jun. 121(6):654-7. [Medline]. Goldman IB. Rhinoplasty; its surgical complications and how to avoid them. J Int Coll Surg. 1950 Mar. 13(3):285-99. [Medline]. Maliniac JW. Prevention and treatment of late sequelae in corrective rhinoplasty. Am J Surg. 1940. 50:84. McKinney P, Cunningham BL. Concepts. New York: Churchill Livingstone; 1989. 31. Millard DR. Secondary corrective rhinoplasty. Plast Reconstr Surg. 1969 Dec. 44(6):545-57. [Medline]. Pardina AJ, Vaca JF. Evaluation of the different methods used in the treatment of rhinoplastic sequelae. Aesthetic Plast Surg. 1983. 7(4):237-9. [Medline]. Parkes ML, Kanodia R, Machida BK. Revision rhinoplasty. An analysis of aesthetic deformities. Arch Otolaryngol Head Neck Surg. 1992 Jul. 118(7):695-701. [Medline]. Pastorek N. Surgery of the nasal tip. Presented at: the Dallas Rhinoplasty Symposium. Dallas, Tex: 1999. Pitanguy I. Surgical importance of a dermocartilaginous ligament in bulbous noses. Plast Reconstr Surg. 1965 Aug. 36:247-53. [Medline]. Rogers BO. Rhinoplasty. Goldwyn RM, ed. The Unfavorable Result in Plastic Surgery. Boston: Little Brown; 1972. Safian J. A new anatomical concept of postoperative complications in esthetic rhinoplasty. Plast Reconstr Surg. 1973 Feb. 51(2):162-3. [Medline]. Safian J. Fact and fallacy in rhinoplasty. Plast Reconstr Surg. 1953. 12:24. Sheen JH. Rhinoplasty: personal evolution and milestones. Plast Reconstr Surg. 2000 Apr. 105(5):1820-52; discussion 1853. [Medline]. Smith TW. As clay in the potter's hand. A review of 221 rhinoplasties. Ohio State Med J. 1967 Aug. 63(8):1055-7. [Medline]. Stucker FJ, Bryarly RC, Shockley WW. Complications in nasal surgery. Ward PH, Berman WE, eds. Plastic and Reconstructive Surgery of the Head and Neck: Proceedings of the Fourth International Conference. St Louis, Mo: Mosby-Year Book; 1984. 156. Thomas JR, Tardy ME. Complications of rhinoplasty. Johns ME, ed. Complications of Head and Neck Surgery. Philadelphia, Pa: BC Decker; 1986. 269. Webster RC. Revisional rhinoplasty. Otolaryngol Clin North Am. 1975 Oct. 8(3):753-82. [Medline]. Wright WK. Study on hump removal in rhinoplasty. Laryngoscope. 1967 Apr. 77(4):508-17. [Medline].